Former squatter Kitty O'Donaghue and Bristol Housing Action Movement spokesman Ben Ritchie talk about the LibCon government's plans to criminalise squatting. Kevin Lister explains next weekend's Bike Ride To Fairford Air Tattoo in Gloucestershire. NATO's Secret Armies: discussion with historial Danielle Ganser about NATO's 'Strategy of Tension using terror against European civilians and pretending it was the Russians or their agents, the notorious Operation Gladio. Tony Farrell was a principle police intelligence analyst for South Yorkshire police but he was sacked when he told his bosses what they didn't want to hear, that the 7/7 London Bombings were not carried out by Muslim terrorists but by the enemy within. The strange death of David Cameron's Constituency party chair Christopher Shale at the Glastonbury festival, assassination expert and barrister Michael Shrimption believes that GO2, a rogue element in MI6, may have murdered him. Did the story about Tony Farrell's report and subsequent sacking make any MSM newspaper or news programme whatsoever? Not as far as I can see. He is doing his own PR work so YOU can help by contacting your favourite press with his story. You think I have a favourite press? I just find it amazing that this can happen. I'll just try and keep spreading these stories in the only simple ways I know. WARNING: If anything I write offends you, tough. This country does appear to be under total lockdown at times. Now might be a good time to hammer away at the message of what the press dont do. Let me know if you think there is someone or something I should be aiming at. The page you requested cannot be displayed at the moment. It may be temporarily unavailable, the link you clicked on may have expired, or you may not have permission to view this page. Strange, I go straight to my profile when I click the link. Is it still blocked? Can someone give me a decent source/link for the Tony Farrell story? Instead of richplanet or any other far out sources. Edit: Can you drop me a pm or let me know if you want to hook up on FB as I normally dont reply to strangers. Thanks. 'A Principal Intelligence Analyst for South Yorkshire Police has spoken out about the July 7th 2005 London Bombings. 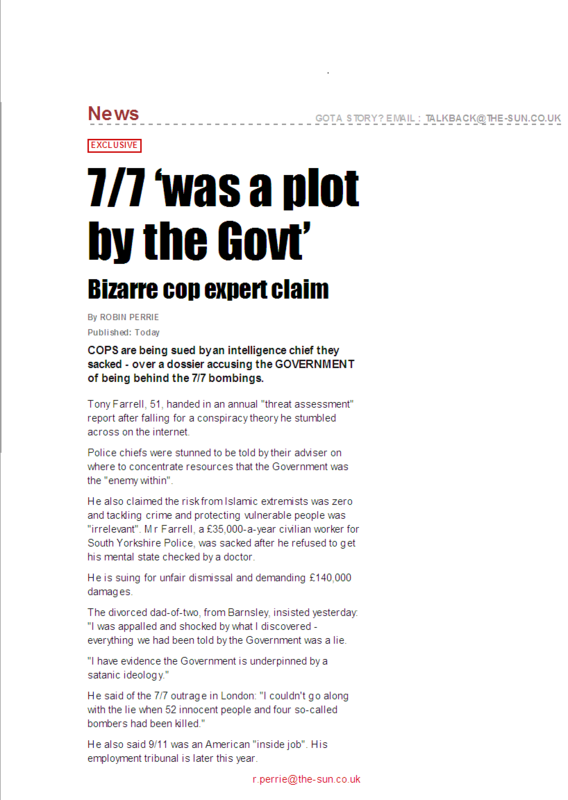 Tony Farrell who has served for the police since 1998 is convinced as he can be that the bombings were a false flag attack carried out by intelligence agencies. In July 2010 he was asked to compile a threat assessment report for South Yorkshire Police. keep an eye on this--if true to form we may find him espousing the NPT followed by becoming a self proclaimed Messiah. Then again he could be another cog (like you and me) in the unveiling of secrets. Extremely unwise IMO for Tony to be granting interviews to Nazi apologist Nick Kollerstrom. Better or worse than the Daily Mail? Many people don't believe that he is a Nazi apologist but exposes the Nazis. And many people who were and are still involved with 9/11 exposure from meetings I have been to will have nothing to do with you Tony because of what you have done in the past and ruined meetings and some even say that it is you who is the apologist. COPS are being sued by an intelligence chief they sacked - over a dossier accusing the GOVERNMENT of being behind the 7/7 bombings. Tony Farrell, 51, handed in an annual "threat assessment" report after falling for a conspiracy theory he stumbled across on the internet. Police chiefs were stunned to be told by their adviser on where to concentrate resources that the Government was the "enemy within". He also claimed the risk from Islamic extremists was zero and tackling crime and protecting vulnerable people was "irrelevant". Mr Farrell, a £35,000-a-year civilian worker for South Yorkshire Police, was sacked after he refused to get his mental state checked by a doctor. He is suing for unfair dismissal and demanding £140,000 damages. The divorced dad-of-two, from Barnsley, insisted yesterday: "I was appalled and shocked by what I discovered - everything we had been told by the Government was a lie. "I have evidence the Government is underpinned by a satanic ideology." He said of the 7/7 outrage in London: "I couldn't go along with the lie when 52 innocent people and four so-called bombers had been killed." He also said 9/11 was an American "inside job". His employment tribunal is later this year. I note he presents government as underpinned by Satanism, while omitting that which is underpinning to be private corporatism. I see no mention of possible Crown involvement here, are they moving for dissolution of the peoples Parliament? The government are essentially taking orders from Adam Street or, the Corporate Crown, as opposed to Constitutional Crown. Can we really afford dissolved Parliament with the corporations removing our entire tax revenue under contract? We have 486 Billion tax revenue collection per annum in this country, we can sort this country out if we kill the corporations and place that revenue back into our economy, the contracts are gained at the expense of the taxpayer this needs to be addressed. State Capture which is the term used for the capture of state by private corporate enterprises, is being facilitated by the Department for Works and Pensions itself having its head office in Adam Street. If Tony Farrell did say "underpinned by Satanism" (which is all encompassing in which is bad/evil) "Life" has admitted his satanic stance in confusion. The Tribunal should be good if he gets the chance to submit his evidence of why he submitted his threat assessment as he did. The pTB are in a cleft stick here--do they pay him off to shut him up, do they bump him off in "unexplained" circumstances, does he go for a walk and commit "suicide" or do they just try an portray him as a looney with the tag that conspiracy theorists are a threat to national security. Or maybe they will just call his bluff knowing what evidence he has is flimsy and already been tested through the "system". What would be interesting is if he shows the method of how threat assessments are normally assessed and then by putting the 7/7 evidence into that method and coming up with the same assessment that he offered. There is no threat from killers, muggers, rapists, or from Al Qaeda. The sole danger to South Yorks is from our “Satanic” Government , which carried out the 7/7 bombings. This same Government is only at war in Afghanistan to seize control of the heroin trade. Oh, and George Bush blew up the Twin Towers. It ought to be hilarious. But the fact that even a top intelligence analyst can be taken in by the lunatic conspiracy theories spreading like a virus via the internet illustrates just how beguiling and dangerous they are. At once they destroy the authority of politicians and police and minimise the real threat, from Al Qaeda. We are lucky in Britain that still only a gullible minority are seduced. COPS are being sued by an intelligence expert they sacked – over a dossier accusing the government of being behind 7/7 bombings. Tony Farrell, 51, handed in an annual threat assessment report after falling for a conspiracy theory he stumbled across on the internet. Police chiefs were stunned to be told by their adviser on where to concentrate their resources that the government was the “enemy within”. He also claimed the risk from Islamic extremists was zero and tackling crime and protecting vulnerable people was “irrelevant”. Mr Farrell, a £35 000 a year civilian worker for South Yorkshire Police, was sacked after he refused to get his mental state checked by a doctor. He is suing for unfair dismissal and demanding £140 000 damages. He also said 9/11 was an American “inside job”. His employment tribunal is later this year. In fact the strongest reason I currently have for believing that Farrell is an honest Truther is my doubt that the intelligence community would try a stunt as half-arsed, verging on the comical, as this. Spooks must take some pride in their work, surely? maybe he is just keeping his powder dry and doesnt want to prejudice his case by saying too much. What ive heard him say would not be enough for me to go to a tribunal with so i am guessing he has more up his sleeve. That’s precisely what he said in his 3 part video 48 mins (approx) interview with Richard D Hall. I like their use of words: "...after falling for a conspiracy theory"
Agree, but that's the RichPlanet interview, from July. This is the September 2011 Jim Fetzer interview. "I said the single biggest threat to the UK is not so much Islamic terrorism, unless you can show me otherwise, but it's internal tyranny"
"The Strategic threat to the UK is from a satanic secret society." Dismissing officer Director of Finance South Yorkshire police: "You may even be correct"